Thyme — herb or medicine? Thyme oils can be microbially powerful, and some varieties are safe to use in all situations, while others are not. A member of the labiatae, or mint family, thyme is an herb that comes in many varieties and is native to the Mediterranean basin. There is only one genus of the plant (thymus vulgaris), but depending on the region in which it grows, the composition of the oil distilled from the plant shows variations in chemical components. Thyme is an easy-to-grow, perennial shrub that can tolerate hot, sunny places well. It is used as a culinary herb and delays the putrefaction of meat, which was useful before the advent of refrigeration. Thyme oils can be microbially powerful, and some varieties are safe to use in all situations, while others are not. Thymus vularis ct linalol is the safest oil for aromatherapy beginners to use on the skin and in baths. But always use with care and in moderation. Thyme has antibiotic, antiseptic, antispasmodic, antiviral, bactericidal, diuretic, expectorant and fungicidal properties that can be helpful during cold and flu season. It also helps the body eliminate toxins and boosts the immune system. 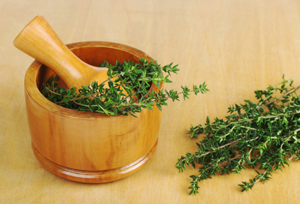 Another traditional use of thyme includes the treatment of respiratory infections. It is an excellent pulmonary disinfectant and is useful against flus, colds, sore throats, asthma, cataracts, coughs, laryngitis, whooping cough and bronchitis. Put a few drops on a tissue and inhale it for nose, throat and chest infections; for gum and mouth infections use in toothpaste or mouthwash. As little as a 0.1 percent solution is effective. A conservative but effective way to use the essential oil of thyme is to add it to a carrier oil and massage it into the soles of the feet. This method allows the oil to reach the whole body without being absorbed into the liver. It is not recommended to use thyme essential oil in its pure, concentrated form directly on the skin, as it can be irritating to sensitive skin. The stronger oils, used in concentrated form, can cause sensitization to the immune system or stimulate the thyroid gland and lymphatic system. Always use it under the guidance of a qualified practitioner. Source: Worwood, Valerie Ann, The Complete Book of Essential Oils & Aromatherapy, New World Library, San Rafael, CA, 1991. ← Is dirty electricity the culprit?